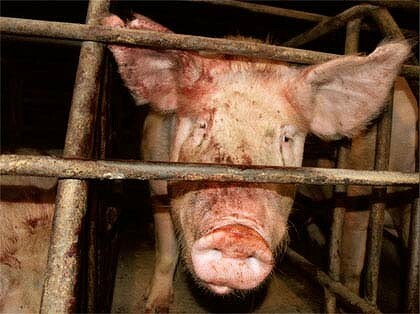 The sad reality for hundreds of thousands of sows is that the cost of getting rid of gestation crates (sow stalls) is being used as an excuse to prolong the cruel practice. Market conditions for raising pigs in a factory setting are changing as Laura Rance pointed out in her February 23, 2012 editorial “The economics of animal welfare.” People are increasingly less prepared to tolerate the inhumane way pregnant gilts and sows are confined in 2 foot by 7 foot crates on concrete slatted floors most of their lives. The Manitoba Pork Council says producers are willing to adjust to changing market conditions. But not until 2025, claiming that it will cost $1 million per existing operation to convert from sow stalls to group housing. Manitoba Agriculture and Food web-posted 2010 cost of production figures for a 500 sow farrow to finish operation show that a new gestation building costs $23.10 per square foot. Total building cost is $311,500. Equipment costs are $18.90 per square foot or a total of $255,000. Salvage value on equipment is 10% on a useful life of 10 years. Buildings salvage for 12% over a 20 year facility life. Thus, a new equipped facility costs less than half of the MPC estimate. Many of the existing barns were built in the late 1990’s and during the rapid expansion years from 2000-2004. They are due for equipment renewal, are at the end of their useful life or are past middle-age. The same is true for environmentally problematic liquid manure storages. Group housing requires less equipment and is less costly than a stall system. Even better is a hoop barn system. Industry has always known straw-based hoop barn housing is dramatically cheaper and sows are “moderately more productive” in this system. Industry has no excuse not to get rid of sow stalls now, re-think how to raise hogs and move to a straw-based group housing system that treats sows humanely and is less problematic to Lake Winnipeg and the environment.